Featured on The Paleo King [link] and SV-POW [link] - it's the Big Bad Brachiosaur Parade! The footprints at the bottom are those of Pleurocoelus and Breviparopus. 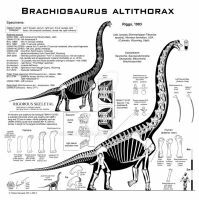 Note: The "Brachiosaurus" shown here was B. brancai, which is now formally known as Giraffatitan (though the alternate name has been used since 1988, first and foremost by Gregory Paul). 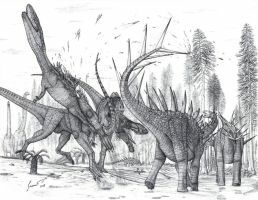 However, the type species B. altithorax was of similar average size. The entire sequence is roughly in order from the earliest brachiosaurs to the last, with the exception of the basal dwarf brachiosaur Europasaurus. Any plans on updating this someday? By the way, this is the best dinosaur size comparison there is, in my opinion. 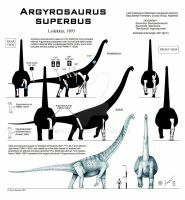 I may update it, but overall not much would change apart from the sizes of a few of these species, and a few proportion changes with Lapparentosaurus and the other basal ones. I'm surprised how well this thing has aged. Are you did compare size to Spinosaurus version. Spinosaurus would be about half a head longer than the T. rex. I put T. rex in there because that's just about everyone's favorite "standard" demarcation line for determining which dinosaurs are true giants and which are merely large. LOL the chess piece with the huge hat... imagine if they find its skull and the crest turns out to be twice as tall as Giraffatitan's. "imagine if it had a crest like a bishop hat"
Though we might see a brachiosaur with a crest of comparable height to a bishop hat. That's if you're talking about those super-tall catholic bishop mitres. If it's the eastern orthodox church, there's already a whole family of dinosaurs that resemble their bishops' hats. Pachycephalosaurs. "BREAKING NEWS paleontologists find a bishop hat on top of a sauropod skull"
wait it's already a thing? Well pachycephalosaurs have a dome, like the shape of eastern orthodox bishop hats (russian church, greek church, etc.). they wear a domed crown not a miter. Mycocephale REALLY looks like those hats. Miters (tall pointy hats with the notch) like you see on the chess piece are mainly catholic bishops and a few other western churches. No dinosaur has a head that shape... that we know of. What about Giraffatitan? That guy was enormous, too. I know this is quite old, but is it relatively certain that the footprints are those of Pleurocoelus and not of some larger species from the same time and place? Most estimates online seem to put it at 60 feet long or less, though I don't know what they're based after. What about Amphicoelias fragillimus? Isn't that the biggest one? That's a diplodocoid, not a brachiosaur. This is the brachiosaur parade. If this were a diplodocoid parade then perhaps I would include Amphicoelias fragillimus. Or maybe not, as it's only known from a single bone which was either lost or destroyed more than a hundred years ago. Inc wich country did they find these footprins they named Breviparopus ? Nice chart btw. Sweet. That would be enormous. Bigger than Argentinosaurus i can imagine. Well, taller and longer, but not heavier. 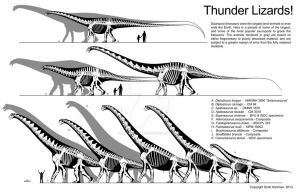 Brachiosaurs were way lighter than Titanosaurs of similar size, but still heavier than Diplodocoids of the same size [85 feet long: 45 Tons (Titanosaur)>35 Tons (Brachiosaurs)>15 Tons (Diplodocoid)]. AH i see. 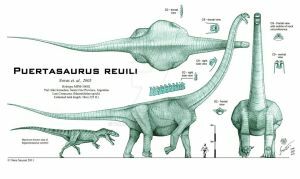 But that largest brachiosaurus must have been way more heavier than the regular brachiosaur we always seen in books and movies. I love it !! Crazy how big they were! Yeah the largest probably reached something around 50 to 55 tons. Crazy big, possibly 95 to 100 feet long, maybe 55 feet tall. So how did you get to Breviparopus"s size? If you found the size of giraffatitans footprint I'd like to know it's size. Breviparopus' size was calculated using its footprints and the general proportions of Giraffatitan. What you see here. I don't have the footprint length-body length ratio off the top of my head. 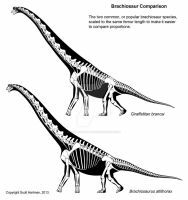 The Berlin Giraffatitan's prints are 70cm, while Breviparopus' prints are 115cm. Brachiosaurs are the best sauropods! Interesting presentation. Information well organized and understandable. how do this giant lizards hearts pump blood all the way to their heads? wouldnt they just pass out? Well (1) they're not giant lizards, they're dinosaurs which is evolutionarily more along the croc/bird line. Dinosaurs are actually separated from lizards by many evolutionary steps and nodes, many more than you will ever see in a school textbook. And (2) they would not pass out because they had a big enough chest to accommodate the large heart that all the mathematical models say would be necessary. As well as they may have had specializations like one way valves (though some experts doubt this, strictly based on modern animals) or a different (non-linear) arrangement of the arteries to compensate for gravity effects. Also most mathematical models don't take into account the power of capillary action, or that their necks were basically full of air sacs which would also put pressure on the vessels, like a gigantic vaccum suit, so getting the blood up to the brain wasn't as difficult as it looked. (3) also because sauropods in general had small brains, they didn't need much blood up there anyway. Although the nose probably needed a good bit in brachiosaurs. Also they were "brainier" than most other sauropods, so this may be a moot point for brachiosaurs.... Giraffatitan (known from teenage skulls) had a brain at least 500cc (likely a bit larger than this for the adults) which is in the Chimpanzee range, surprisingly enough. that's possible too but I suspect the fact that the neck was so heavily pneumatized with air sacs created almost a vacuum effect around the arteries in the neck as the dinosaur exhaled, which pulled more blood up into the neck. Alright that explains alot thanks! Trees pump water just fine up to their tops. Obviously the two living things are nothing alike but if plants figured out a way with out exploding themselves from the pressure, I'm sure so could Dinosaurs. Fantastic illustration. 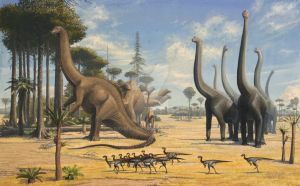 I grew up thinking Brachiosaurus was the tallest dinosaur. But now.....wow! Just look at the size of these beasts! And little Europosaurus XD I'd ride her to school. Yes Europasaurus is pretty cute. But it's not the smallest brachiosaur anymore, apparently. The Croatian Dwarf is even smaller. 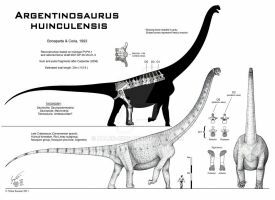 There are a number of dinosaurs that were taller than Brachiosaurus (or at least its holotype specimen, which died before reaching full size). Sauroposeidon, Puertasaurus, Daxiatitan, and a whole host of other vertical-necked high browsers. 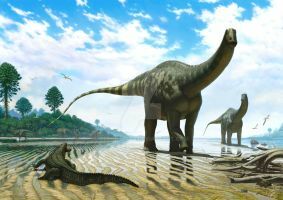 However few dinosaurs were both taller AND heavier. 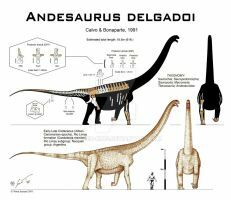 Perhaps only the really big titanosaurs like Puertasaurus and Alamosaurus. 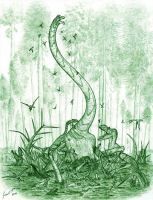 Breviparopus was apparently also outclassed by "Brachiosaurus" nougaredi, a species that needs its own genus and was NOT a form of Brachiosaurus, although it probably was from the same family. 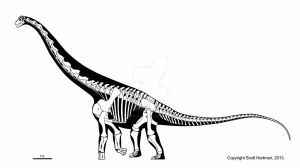 This beast is known mainly from an imcomplete sacrum, but probably approached 130 feet assuming it had similar proportions to Giraffatitan. Good lord, and to think our planet was once blessed with these creatures. Wait, regarding your tyrannosaurus, I've heard that MOR 008 was smaller than sue and just had an unusually elongated skull. What's your view on this? Since I don't know of any postcranial remains for MOR 008 (far as I know it's just the skull) I can't make that kind of judgment. The real problem is that it's a fragmentary skull, and all the big T. rex skulls are roughly similar in size. But with varying proportions. Whether MOR 008 ends up reconstructed bigger or smaller than Sue's skull depends on the prophetions you give to the missing parts. Restore it like Sue or Wankel (long upper jaw, deep cranium region, big overbite) and it's bigger than Sue. Just like Jack Horner did it (one of the few things I agree with him on). But if you try to reconstruct it like the AMNH specimen or Stan, it comes out a bit smaller than Sue. Of course MOR 008 isn't just along skull, it's also a thick and deep one. So the whole "it's a younger animal with a more gracile skull" rumor simply isn't true. It's possibly the most mature and robust T. rex skull on record. The rugose nasal bone indicates an even older and gnarlier-looking animal than Sue. There are only footprints. But these, at nearly 1m wide, are still much smaller than the bigger sauropod prints that have been found. The tracks at Plagne, Frange, and those of Parabrontopodus distercii are pushing 2m wide.